Prepare to be amazed when you set foot on this stunning Five Star floating Beach Club new to Gran Canaria, after previous summer seasons spent in Ibiza and Barcelona. The 5 Star Boat sails every day from 10:30-14:30. Transport/Hotel Pick up is included from all resorts in the South of Gran Canaria. Hotel Pick ups are from 09:20 - 10:15 depending which hotel and resort you are staying in. You board the boat at Puerto Rico Harbour and from here, you will cruise along the beautiful coastline of Gran Canaria. 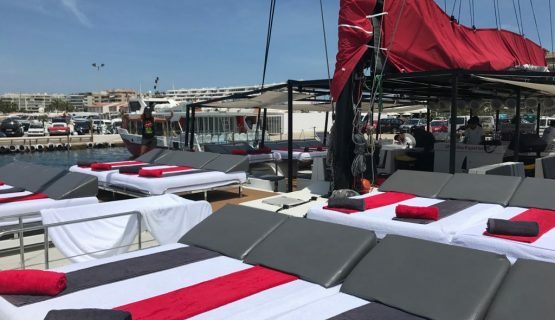 The Staff on board will go above and beyond to ensure that you are happy and comfortable throughout the trip and all inclusive Sangria, Beer and Soft Drinks will be served on-board. There is a fully stocked bar on board, so you can buy your favourite Premium top shelf drinks or sample one of the delicious cocktails served by the talented bar tenders. If you wish to upgrade to VIP you can do so on the day. why not enjoy one of the many Balinese beds and this also includes a premium bottle of your choice. We sail to Anfi Del Mar, which is a beautiful coved beach, famous for its white sands and turquoise calm water. Here you can enjoy a swim in the sea. 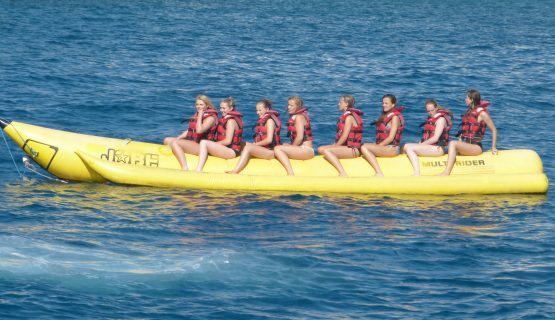 The banana boat is included in your ticket Price. If you would like to try any of the watersports, such as Jet Skis or Parasailing, this can be done from the boat and you will receive a substantial discount exclusive to our customers on the boat trip. As we gently cruise along the coast, you are offered tasty meditteranean style BBQ Chicken, Canape's and tropical fruit. 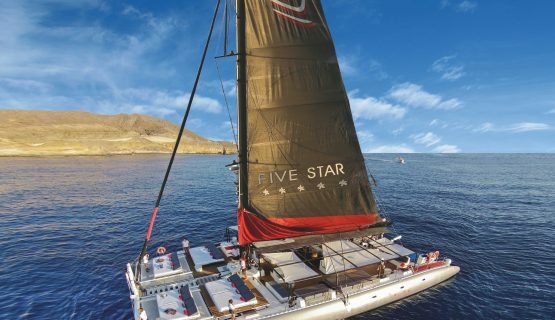 Book the Ulitimate Five Star Boat Experience here online and save €10 and get the special price of €55 instead of the price in Gran Canaria of €65! 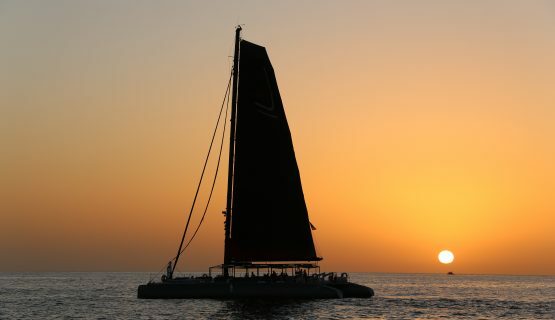 Prepare to be amazed as soon as you set foot on this stunning Luxurious Five Star Catamaran! 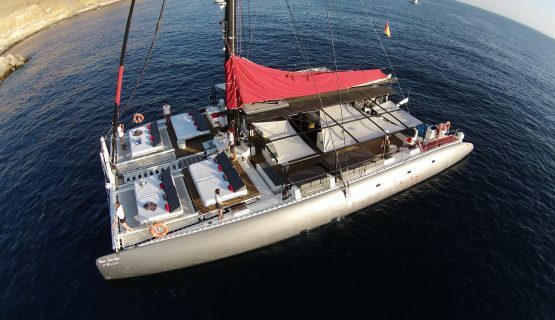 Prepare to be amazed when you set foot on this stunning and very impressive boat, new to Gran Canaria, after previous seasons spent in Ibiza and Barcelona. With wooden floors, Buddha´s and white Balinese beds, this boat has it all. 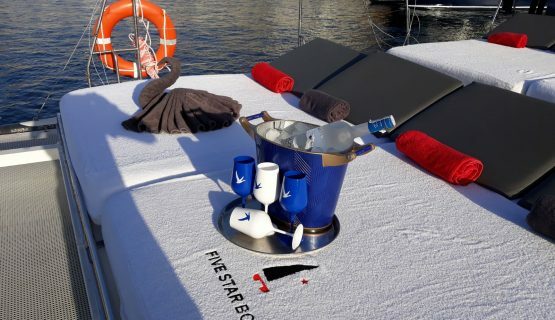 The Five Star Boat truly lives up to its name, with an amazing sound system on board and its very own DJ, who plays chilled out tunes, making you will feel like you are on a floating Beach Club. Transport is included from all resorts in the South of Gran Canaria. You board the boat at Puerto Rico Harbour and from here, you will cruise along to amazing music from the DJ, passing the beatiful coastline of Gran Canaria. The Staff on board will go above and beyond to ensure that you are happy and comfortable throughout the trip and if there is anything you need, they will be happy to assist you, where possible. If you wish to upgrade to one of the many Balinese beds, you can do so with the VIP Upgrade make yourself comfortable on one of the many Balinese Sunbeds. This also guarantees you priority boarding, use of a towel and a bottle of your choice. You do not have to come to the bar yourself, as one of the many staff are more than happy to take your order and bring your drink to your bed. Pay for VIP and be treated like one. Throughout the trip, you have can help yourself to Sangria, Beer and Soft Drinks, included in the standard and VIP ticket price. 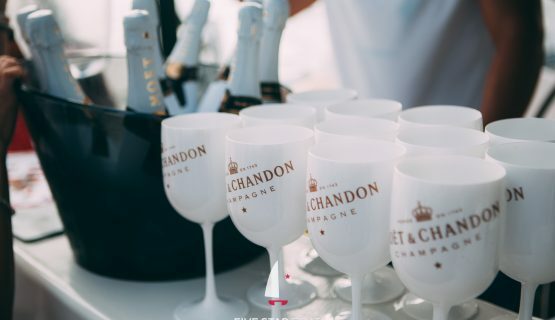 There is a fully stocked bar on board, so you can buy and of your favourite Premium top shelf drinks or sample one of the delicious cocktails served by the talented bar tenders. As we gently cruise along the coast, you are offered tasty meditteranean style snacks and wraps, also included with the ticket. We sail to Anfi Del Mar, which is a beautiful coved beach, famous for its white sands and turquoise calm water. We anchor here for around two hours, where you can enjoy a swim in the sea. It is also a chance for you to do some snorkelling with one of the on board snorkel sets or maybe try a banana boat. The banana boat is included in your ticket Price. If you would like to try any of the watersports, such as Jet Skis or Parasailing, this can be done from the boat and you will receive a substantial discount as part of the boat trip. If swimming isn´t your thing, feel free to stay on board, listen to the music and enjoy a cocktail. We then begin our cruise back to the harbour of Puerto Rico, with more snacks and chilled tunes to end a perfect day. Once back at the harbour, we will return you by coach transfer back to your resort, leaving you with amazing memories from an amazing day out. Click Book Now, select your desired date and reserve! What days do you sail?